Last week we delved into the most basic of turkey frying rules, which is don't put too big of a turkey into too small of a pot. This week, we explore the physics involved with mixing water and oil. That's horrifying. 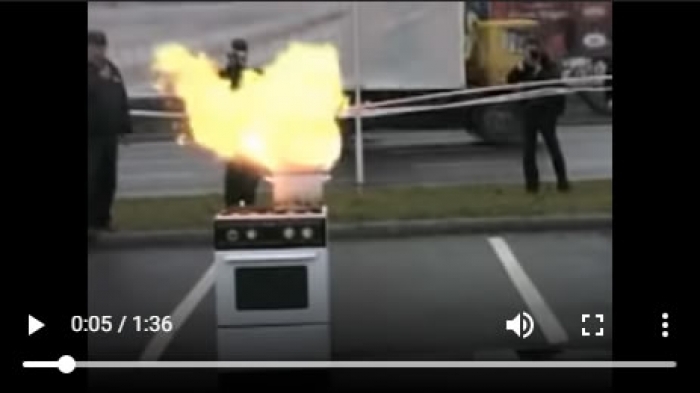 Talk about kitchen combat; it looks like a bomb went off in that pot. So what causes this? Believe it or not, it has little to do with that oil-not-mixing-with-water phenomenon at lower temperatures. Steam is the answer. When water becomes steam, it expands rapidly to about1700 timesits original volume. Because water boils at 212 F and you fry turkeys at around 350 F, any water that comes in contact with properly heated oil will become steam. Because of the nature of two liquids mixing causes a large volume of the water to come in contact with the oil, a lot of steam is generated very quickly. When the water turns to steam and rapidly expands, it pushes much of the oil out of the pot. The many droplets of oil flying from the pot form a much greater surface area available to burn than before. Thus the fireball. As a sidenote, you can safely boil water because a) it doesn't burn and b) the nature of boiling water in a pot (liquid to solid contact rather than liquid to liquid) causes only a small amount of water is convert to steam at a time . What have we learned? DON'T put a grease or oil fire out with water. You will make things much worse for yourself. So what can you do? Invest in a Class B fire extinguisher, which typically contains carbon dioxide to keep oxygen from reaching the flame. Barring that, you can pour baking soda on small grease fires to extinguish them. Most of all, when frying up a turkey, make sure it isn't frozen (as frozen turkeys contain a lot of water that will evaporate and otherwise run off when thawed), get a thermometer to make sure your oil is the correct temperature, go slow, and exercise common sense. Thanksgiving is just around the corner, so if you don't have a thermometer yet, feel free to support our sponsor and get one throughRestaurant Equipment Worlds siteFood Safety World. If you need a good pot to fry your turkey in this year, check outPot Pan World, too. Thanks for your time, and I hope we've enlightened you on how to avoid the need to combat your own kitchen.